Pearl's Vision Birch Lacquer kit brings professional features such as custom-style finishes and hardware with affordable shell construction. Great price for a great kit. Ready to gig. Looks beautiful. 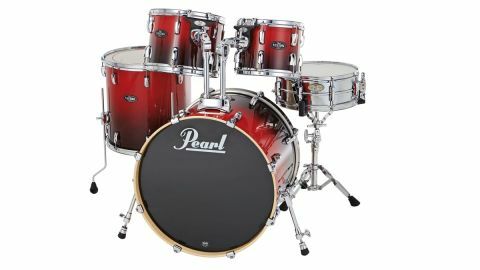 Pearl introduced its Vision series to great fanfare back in 2008. Heralded back then as a replacement for the best-selling Export series, the Vision kept its predecessor's solid build quality but introduced 100 percent maple and birch shells to the mass market. Since then, Pearl has reintroduced the Export name and the Vision series takes a step upmarket as the Vision Birch Lacquer/VBL series. Billed as Pearl's "most affordable 100 percent birch shell pack", can the new Vision find clear water between the revised Export beneath it and the higher-end Session and Masters series drums? The Vision Birch Lacquer (VBL) features, as the name suggests, shells comprising six plies of 100 percent birch. Each shell is constructed using Pearl's proprietary SST system, which uses overlapping scarf joint seams for what Pearl says is a "perfect air-tight fit". The drums are available in three pre-configured kits: a 'fusion' setup with 10" and 12" rack toms and a 14" floor tom, and a 20" bass drum; a 'fusion-plus' set-up with a 16" floor tom and 22" kick in place of the 14" and 20", and finally the more 'classic' 12", 13" 16" and 22" set-up. Each kit comes with a 14"x5" steel Sensitone snare and a Pearl 930 hardware pack which includes 930-series straight and boom stands, a hi-hat stand, snare stand and a P930 pedal, which includes features from Pearl's flagship Demon Drive pedals. "Under stage lights the VBL's finish pops, reinforcing the notion that it is a higher-end kit." The new Vision kits are available in five lacquer-only finishes: natural, Graphite Fade, Prussian Blue, Black Burst and finally a fetching Ruby Fade. In addition to the kits, Pearl also offers a number of add-on toms. Our test kit is the mid-configuration with the 16" floor tom and 22" bass drum in that aforementioned Ruby Fade which goes from red to black in a vertical fade across the shell. The kit displays exemplary fit and finish across the drums - the lacquer finish is deep, glossy and flawless - the kind of finish that 10 years ago would have been found only on Pearl's flagship ranges. Each drum features lugs reminiscent of the Reference series, and die-cast bass drum hoops seated on rubber gaskets to isolate the shell. The rack toms are mounted on Pearl's ISS mounts and all the toms have Remo Pinstripe batters, with a Powerstroke batter on the bass drum. Out of the box, the VBL kit's fade finish displays a depth of colour rarely seen at this price-point - it really is striking, and is offset neatly by the bright chrome lugs. One particularly nice touch is the differing lacquered bass drum hoops - one of which is in red and one in black, each one at the colour extremes of the fade on the bass drum. The Pinstripe batters mean that a useable sound from the kit is easily found with just a few turns of a drum key. The thin, stiff shells mean that the fundamental tone comes through clearly and brightly - a very focused sound without too many overtones. Pearl says the birch shells feature "boosted high frequencies, slightly reduced mids and a good low-end punch" and it's apparent that they have a strident, authoritative tone that cuts through well. "The thin, stiff shells mean that the fundamental tone comes through clearly and brightly - a very focused sound without too many overtones." The Sensitone steel snare includes Pearl's Duo strainer which can be converted between two modes of operation, and cuts right through, with brightness and an articulate voice. The Pearl tom holders are a ubiquitous design familiar from a thousand rehearsal rooms, but it's only when you use the real deal that you realise that the rest are all pale imitations - the fine-geared tilters mean that positioning the toms is easy and, once in place, they stay in place. The 930-series hardware is very sturdy - double-braced and as solid as a rock, but features nice touches such as Pearl's new 'wave'-design screw, meaning it's easier to apply torque to the screws. The P930 pedal has tuneable cams, lots of adjustability and responds to fast patterns well, its design also matching Pearl's higher-end Demon Drive pedal. The hardware means that the kit is easily set up and all of the drums are well- supported meaning there's no disconcerting wobble when playing hard. Whilst we're sceptical about the suggestion that birch has a "pre-eq'd" sound, the un-miked drums do cut through a five-piece band with ease, despite the relatively thick Pinstripe heads, though there was a noticeable drop-off in volume towards the back of the room, which thinner or single-ply heads might help to counter, though of course the Pinstripe head makes up for this with its reputation for durability.Under stage lights the VBL's finish pops, reinforcing the notion that it is a higher-end kit.